Unless you’re trolling Reddit, Imgur, I Can Haz Cheezeburger or sites of the like, cat photos are rarely welcome on an actual social network. No, I don’t care how funny that thing looks in an oversized hat or how peaceful it seems when it’s sleeping. Don’t put that on my Instagram feed twice a day. If you know any cat-obsessed friends needing a place where their insanities are encouraged, look no further than Catmoji. The Malaysian-based startup saw an opportunity in the Internet cat market and launched the site exclusively for people to share their videos and photos of cats. 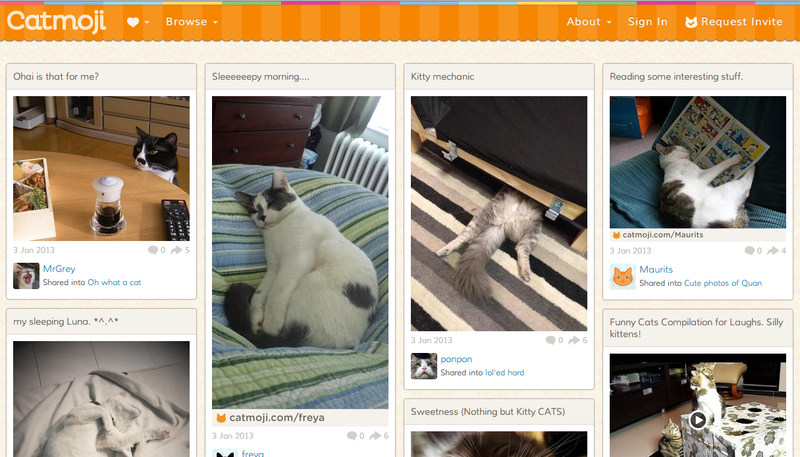 You can browse for various types of cat photos, such as “Cute,” “Sad,” or “Surprise,” or you can browse user albums that are set to public. Much like every other social media on the face of the Web, users can Like content and share it to their viral heart’s desire. “The Internet loves cats, we also love cats, and cats make people happy,” Catmoji founders Matthew Phiong and Koekoe Loo told Betabeat. “Catmoji is a serious business … We want to be the online identity for cats, i.e. Facebook for cats.” Nevertheless, Phiong and Loo aren’t exactly clear on how exactly Catmoji monetizes, since the recently-launched social network does not contain ads (at the moment) and has a limited number of users. And while this is all fun and dandy, Catmoji may all sound far too similar to the works of I Can Haz Cheezeburger or Buzzfeed. But, rest assured, these photos and videos are from your Web friends – not curated by an editorial team. You know, because people actually get paid to do this stuff, so stand up against those the man and run your own stream of silly animal flicks. What makes these photos different than the ones scoured by Internet pros is beyond us, but if you need a place to send your annoying cat-loving friend, now they have a community that’ll accept them for who they are. And honestly, now that we’re all back to work and struggling with our vacation and holiday addled minds, maybe some stream of silly cat videos to lighten up the day isn’t such a terrible idea.